Shall we dance? Let me grab my two-tones! Today is July 4, which marks the two-year anniversary of my involvement with Swing Beijing!. And how am I celebrating? By skipping, actually. For the last two years, Swing has not just been a part of my life, but it has been my life. I found it at a time when I was just emerging from a one-year hermit phase. Thus, it launched me from my social isolation into a world where I was having multiple encounters with people each week. It also broke my one-year isolation from other foreigners here in China. It allowed me to develop the extroverted part of my predominantly introverted nature. But it seems as though that time has come to a close. No, I’m not closing myself off and re-entering a hermit phase. I’m just moving away from Swing and concentrating my creative energy in other areas. In November last year (2004), I started to discover other bloggers and also the phenomenon of podcasting. I started connecting with people online, and I began contributing to conversations with others through leaving comments and giving feedback through email. And it has been an exciting time for me. I’m not sure what the ultimate goal of this new direction in my life is, but I can tell that it’s the right direction. And that’s thrilling. The hosting woes that I experienced a few months ago forced me to find a new hosting solution and ultimately a new blogging tool called WordPress. And the change has been fantastic. It’s a very powerful tool. But I’ve been sitting on the default look of the WordPress 1.5 install since then, so my site looks like too many others out there. I have been looking for a new design for the header at the top of the weblog, and I finally found one last week. So, here is the new look. It’s a star scene that I generated entirely from the mathematical functions found in the GIMP drawing program. I feel it suits my character and the nature of a “Mad Philosopher” quite well. Here is a screenshot of the new look. Here is the old look for comparison. As always, comments are welcome. Thanks for joining me in the journey thus far. 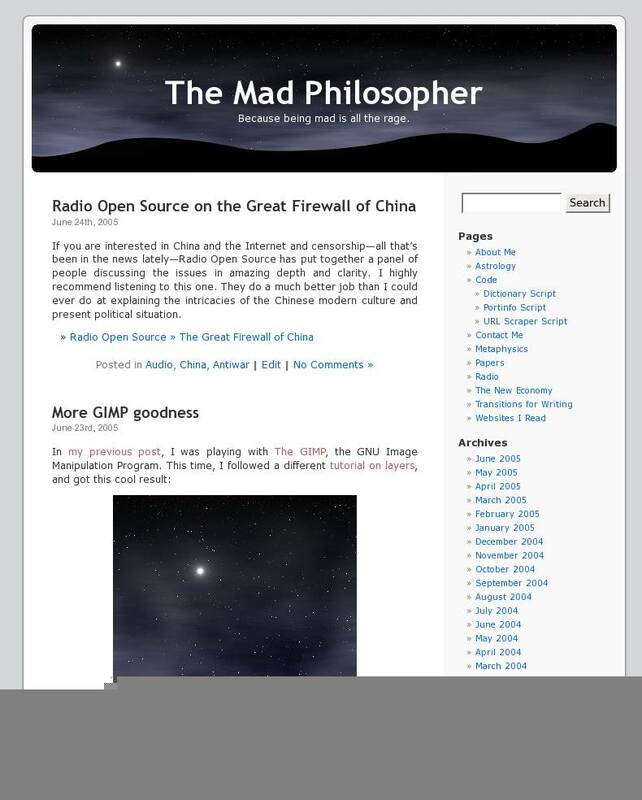 This entry was posted in China, General, Swing, WordPress on July 4, 2005 by Darren. This is my first visit to Shanghai. I hear it’s quite different from Beijing. A different feeling, history, dialect, culture. Everyone will fly home on Sunday evening, except Allena, Gulistan, and I will stick around and tour the city for two days. Then, a boat trip to Suzhou (the Venice of China), and a day and night in Hangzhou (the Silk Capital of China). 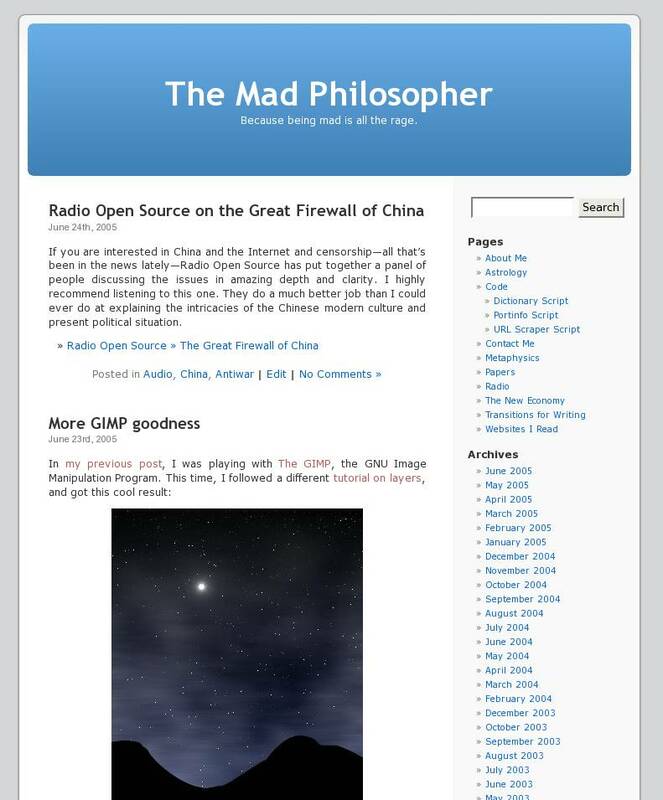 This entry was posted in China, Swing on April 21, 2005 by Darren. Well, I’ve got a day and a half left here in Edmonton before I return home, so perhaps I’m a little late with a blog entry about my vacation. It’s been great with only a few glitches. I spent my first week here being sicker than I’ve ever been in my life. Then week two saw me very unproductive with a severe case of fatigue. Fortunately, it went away, so I’ve been able to get things done and to see a few people during this last week without any health problems holding me back. My mom and Aron got married last week and it was fun and beautiful. They’re now in Spain and I’ve got the house and my mom’s car to myself. I had a great conversation with my friend Dave Ballantyne about all things copyright and capitalism. I learned some surprising things about how the idea of intellectual property is actually anti-capitalist, and so is 100% of all discussion on either side of the copyright war. But the world has to wait until Dave finishes his Master’s thesis this summer before we can read his ideas on the subject in essay form. And last night I had a great conversation with my friend Bruce Dean about his life right now, his adventures being the official driver for Alberta Liberal leader Kevin Taft during the election campaign, and how he got wrongfully fired three weeks ago and is now fighting to get his job back on two fronts. And yes, as he said, he seems more at peace about his life now than he’s ever been before. I wish him well. Tonight I’ll have dinner at my sister’s. And then tomorrow I’ve got a dance with Swing-Out Edmonton. Sunday morning I fly outta here, in time to catch the dance class in Beijing on Monday night. See y’all there. This entry was posted in Copyright, General, Swing on March 18, 2005 by Darren. I must say it was an amazing weekend. Two and a half days of straight Lindy Hopping with people from all over the world on a tiny resort island in Singapore. The temperature was above 30°C each day, and the humidity was something to be reckoned with. But I didn’t once complain about the heat, cause it was a welcome change from a very cold -6°C Beijing winter. We drank lots of water, and changed our t-shirts regularly, and swam in the pool and the ocean to cool off. Wonderful! I didn’t get much of a chance to see Singapore, but I was lucky enough to spend Thursday night with a local family in their home. It was quite a contrast to Beijing. First of all, I couldn’t imagine that they would be living in a house (maybe it was a townhouse) as opposed to an apartment. Singapore is a very small island, but its population isn’t that large (4.6 million, July 2003), so it’s not crowded enough to exclude real houses for some families. I was very impressed. It’s right-hand drive in Singapore, so all the cars are on the left-hand side of the road. That was something I never got used to, a problem that could lead to a deadly mistake by looking the wrong way while stepping onto the road. It’s a beautiful city with a very organized public transit system. Unfortunately, bicycles are not allowed on the roads or on the sidewalks! Where do they go, then? Well, I saw very few bicycles being ridden. So don’t expect me to ever settle in Singapore! On the resort island, I spent one afternoon looking around. I got to visit Artists Village, which is an art gallery and studio, home to about five resident artists. It wasn’t a well visited attraction of the island, but I enjoyed the peaceful quiet desertion of the gallery. This is one memory I’ll take with me from the weekend that wasn’t related to dancing. Another good memory is the time I spent with Steve and Angela, since we shared a 3-room hut together. One night after the lights went out, we had a story time, where I got to learn how Steve and Angela met. It’s a good story involving a lost girl, a butcher knife, and a guy lying on the ground bleeding from the head. It ended with Steve and Angela walking the streets of Dalian holding hands. They stopped there, not wanting to share the rest of the details. 🙂 They’re a sweet couple. And unlike some couples while telling a story, they interrupt each other in a good way, adding details instead of fighting about them. They are friends I will keep for a lifetime. Well, the plane is descending and soon it will be time to pack up my keyboard and put the lunch tray away. Beijing, here I come. I’ll head home, wash, pack for tomorrow’s trip, and then go for dinner with Gulistan before Swing tonight. It don’t mean a thing if it ain’t got that Swing! Tomorrow I fly to Edmonton. I don’t enjoy the 11-hour flight to Vancouver or the jet lag, but it will be great to see family and friends again. This entry was posted in Swing on February 28, 2005 by Darren. Tomorrow afternoon, I’m off to Singapore for two days to attend SEA Jam 2005, a Swing Dance camp on the tropical island of Sentosa. Adam, River, Hong Yin, Steve, Angela, and John will be going too. There will be classes all day Saturday and Sunday, and dance parties on the beach from Friday to Sunday. It’s going to be a blast. I come back to Beijing and sleep in my own bed Monday night, and then Tuesday I head home to Edmonton for three weeks. The reason for the trip is that my Mom is getting married to Aron on March 10th, and I’m really excited for her. I will also be able to catch Trinity’s second birthday on March 3rd. All in all, it’s going to be a great vacation. See you in Singapore, Edmonton, Calgary, or Beijing! This entry was posted in Swing on February 23, 2005 by Darren. So much has happened in the last few days, or even hours. It’s 4h12 in the morning, Saturday morning, and I just finished a very cool Friday night. Since being in the taxi on the way home, I’ve wanted to sit down and write a blog entry. I haven’t done that in a while. I started the evening in the afternoon. After researching what needs to be done to get me a new passport, I headed over to Qiao Ying’s tea house. I spent the afternoon drinking tea and speaking Chinese with her and my friend Zhang Hua. Sometimes Qiao Ying gets in these moods where she refuses to speak English. So I played along and I didn’t speak English either. It’s really good for me, actually. It really helps. I went through three kinds of teas during my stay there, met a new friend of Qiao Ying’s, and then left to join Mandi for her farewell dinner. I didn’t have far to go, and traffic wasn’t bad, but there were no empty taxis. I waited, changed locations, and then waited some more. So I eventually took a bus. On the way to dinner, Joanne pointed out to me that my backpack was open. Did I leave it open from the tea house, all the way on the bus ride? Or did someone open it while I was walking or talking to Paul in front of Ya Show? Yikes! I didn’t find anything missing until later. My minidisc was still there as well as my USB sound card and Palm Wireless Keyboard. (Yes, my backpack is an arsenal of geek electronics. Go Darren!) It was only after dinner that I realized that my $300 Etymotic ER-4P earphones were missing. I’ll never see them again. The disappointing thing is that the new owner will have no idea the true value of their new prize. Damn. Back to el-cheapo $10 earbuds for a while. At least the Etymotics are well coated with a couple month’s worth of my ear wax. Hope the new owner doesn’t actually use them. I skipped out on Mandi and drinks on San Li Tun at 22h30 after dinner cause I wasn’t in the mood. It’s really not my scene. Adam and the gang were going to be at The Big Easy a few kilometres away, so I decided to join them. I wasn’t feeling so hot, actually. Mostly just tired from being sick all week with the flu. But I found myself telling the taxi driver to go there, so I just went with the idea. The Big Easy was alright, but nothing too great. The band was swinging a bit so Adam and River danced, and I got one dance in with River. I would have liked to spend time chatting with Adam and River, but an impromptu business meeting between them and the owner cut our time short. The belly dancer gave a couple of performances, but I wasn’t impressed. I just couldn’t get into it. Besides, her hair was dirty and her costume (what little costume she was wearing) had big food stains all up the front. Pretty yucky. But, during one of the belly dances, I looked up at the balcony and, to my surprise, saw my friend Cheng Lei there. So I immediately left my friends and went and said hello. This is the second time that she and I have met “by luck” in this area. The other time happened at Latinos, next door to The Big Easy, about a month and a half ago, just before I left Beijing. (And I never go to Latinos.) So we were quite happy and surprised to meet like this again. It made the whole evening worth it. Plus she smiles so nicely at me. We chatted for a while until Adam phoned me looking to see where I was. I literally had disappeared on the group without a trace, so they wanted to know where I was. I felt loved. So we came down and said hello to Adam, River, and John for a few minutes. Cheng Lei had friends over at Latinos, a Brazilian dance performance group that was in Beijing for the week, so she invited me to join her over there. I hesitated, but finally agreed. I have never felt comfortable at Latinos, especially since Latin dancing/music isn’t my thing. But I’m so glad I went with her. Although Cheng Lei likes dancing (she’s a salsa teacher, even) she just wanted to watch the others dance. But when I told her that I wanted to dance with her, she invited me to dance Swing to the Latin music. I was surprised that it even worked, but I guess it can be done cause we did it. And it was fun. She made me feel so comfortable there that I had no problems being there, dancing my own way, and enjoying myself. We met up with her friend Julia, and after the Brazilians left, the two of them decided the music at Salsa Caribi would be better. So, back to San Li Tun, and I got to try out a new club. Since I never dance Salsa in Beijing, they’re all new to me. Salsa Caribi seemed not too bad. An acquaintance, Mustafa, was there outside the club, so already I had a friendly face to welcome me. The two girls, Cheng Lei and Julia, took to the dance floor immediately, so I just waited at a table. I saw my friend Irene dancing there too, and eventually discovered that all of my friends of Irene were there: Karen, Maple, and Christine. Seeing them was a treat, especially Karen since I haven’t seen her in so long. She’s been busy with work-related travel for many months now. I had the best time with Cheng Lei and Julia at Salsa Caribi. They were dancing pretty hard, and when I joined them, I started dancing hard too. We danced and danced and danced. Some of it was Swing (but not to Swing music). Some just disco, and lots of Latin. I started to figure out the arm thing, twisting you and your partner’s arms in and out of pretzel contortions. Lots of fun. We played with it a lot, sometimes doing the pretzel thing with all three of us holding hands. A very sweet night. I’m really feeling blessed by the whole thing, how it all turned out. I’ve been dealing with a lot of internal struggles and realizations lately, stemming from events in and related to returning from Canada. (I can only post weblog stuff when I’m being outgoing and external, which is why my posts are as infrequent as they are.) So I think tonight’s events have corrected my thinking in various ways, helping me to keep on the correct path that I need to follow. It’s what I needed. This entry was posted in Audio, China, Palm, Swing on September 3, 2004 by Darren. I’ve had two great experiences here in Edmonton so far, to do with the sky. The first was when I was walking back to my car after being out at a Blues club with the some of the Swing dancers here. It was some time after midnight and I was heading home. I thought I saw some northern lights in the sky, very faint, like wispy white clouds in the dark sky. So I left my car and went to the nearby park which has an awesome swing set, and I swung for a couple of hours under the lights. As expected, they got brighter and more active. Very beautiful, and an excellent reminder of why I live (or used to live) in such an amazing place. The second was last night. There’s a fair going on here called Klondike Days, and a Swing band was playing at the outdoor stage that night. So eight of us dancers went and crashed the show, dancing off to the side of the stage. It was cool, but a bit difficult to dance to everything the band was playing. There was some threat of rain, but we only got spit on at the start of the show. But as I was dancing, I noticed a very bright rainbow hiding in the clouds, in full view of the stage. The audience missed it since the rainbow was behind them, but I’m guessing that the band and I were the only ones who saw it. So I got to dance Swing under a rainbow. Now that was a once-in-a-lifetime experience. This entry was posted in Astro, Swing on July 30, 2004 by Darren.